The nursing profession has impressively evolved over time, and along with this transition came the development of different nursing theories. 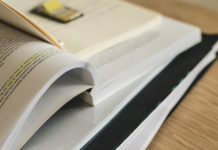 These theories provide the foundation of nursing practice, specifically nursing assessment, intervention, and evaluation. They also offer a framework for generating knowledge and new ideas. This mid-range theory serves as a framework for nurses in providing appropriate health care interventions to mothers, helping them develop a strong maternal identity. 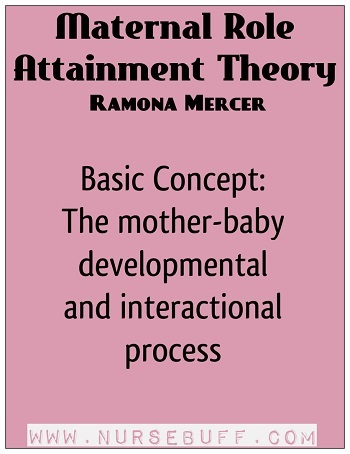 The basic concept of the Maternal Role Attainment Theory is the developmental and interactional process, in which the mother bonds with her baby while acquiring competence and expressing joy in her role as a mother. Ramona Mercer spent more than 30 years doing research about parenting in low and high-risk situations as well as transition into the maternal role. She began with a study of mothers who gave birth to infants with a birth defect (1971-1973). She focused next on teenage mothers during their first year of motherhood. Mercer also participated in a cross-cultural comparison of mothers’ responses to cesarean and vaginal births. Her research has provided clinicians with information on how to make a difference in the lives of new parents. The Self-Efficacy Theory originated from the Social Cognitive Theory by Bandura. 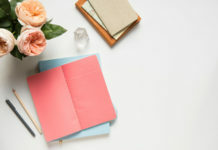 The latter states that there are three factors that influence self-efficacy: Behavior, environment, and personal factors. These factors affect each other, but the personal or cognitive factors are the most important. According to Bandura, “motivation, performance, and feelings of frustration associated with repeated failures determine affect and behavior relations”. Self-efficacy, or the belief that one can manage one’s own health, is an important goal of health care providers, particularly in patients with chronic illnesses. Born in Alberta, Canada, Bandura has done a great deal of work on social learning throughout his career and is famous for his “Social Learning Theory” (later renamed “Social Cognitive Theory”). Bandura focuses on the acquisition of behaviors. He believes that people acquire behaviors through the observation of others, and then imitation of what they have observed. The Tidal Model refers to “a philosophical approach to the discovery of mental health.” By using their own language, metaphors and personal stories, people begin to express something of meaning to their lives. This is the first step towards regaining control over their lives. The theory provides a framework for the exploration of the patient’s need for nursing care and the provision of individual care plans. For nurses to begin the process of engagement using the Tidal Model, the following needs to be accepted: recovery is possible; change is inevitable; ultimately, the patient knows what is best for him or her; the patient possesses all the resources he or she needs to begin the recovery journey; the patient is the teacher, while the helpers are the pupils; and the helper needs to be creatively curious, and to learn what needs to be done to help the person. 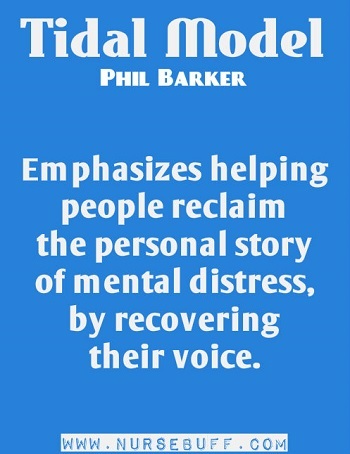 Phil Barker was United Kingdom’s first professor of psychiatric nursing at the Newcastle University. He started out as a nursing assistant and eventually became one of the UK’s first nurse psychotherapists. His wife, Poppy Buchanan-Barker, also had her own contributions to the Tidal Model. 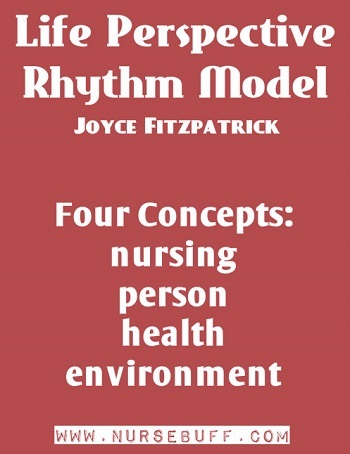 The Life Perspective Rhythm Model includes the concepts of nursing, person, health, and environment. 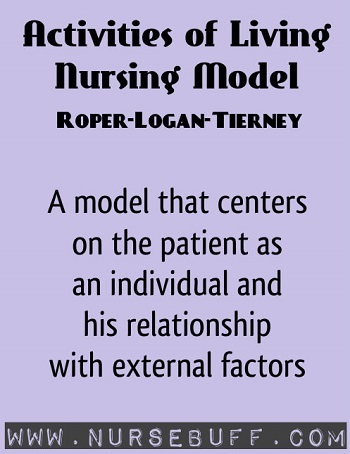 The model contributes to nursing knowledge by providing taxonomy for identifying and labeling nursing concepts. In this model, health is identified as a basic human dimension in continuous development. The theory assumes that “the process of human development is characterized by rhythms that occur within the context of continuous person-environment interaction” and that nursing activities basically focus on enhancing the developmental process towards health. The model recognizes individuals as having unique biological, psychological, emotional, social, cultural, and spiritual attitudes. Optimum health is described as the actualization of both innate and obtained human potential, goal-directed behavior, and expert personal care. Fitzpatrick earned her Bachelor of Science in Nursing from Georgetown University. She later founded and led the Bolton School’s World Health Organization Collaborating Center for Nursing and has provided consultation on nursing education and research throughout the world, including universities and health ministries in Africa, Asia, Australia, Europe, Latin America, and the Middle East. 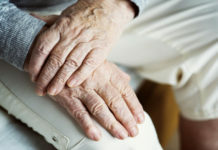 Fitzpatrick’s research has been focused on dimensions of meaningfulness in life, including the meaningfulness of nurses’ work as related to satisfaction, turnover, and empowerment. The Theory of Comfort is a mid-range theory for health practice, education, and research. It has the potential to place comfort in the forefront of healthcare. In this model, nursing is described as the process of assessing the patient’s comfort needs, developing and implementing appropriate nursing care plans, and evaluating the patient’s comfort after the care plans have been carried out. Born in Cleveland, Ohio, Katharine Kolcaba earned her diploma of nursing in 1965 from St. Luke’s Hospital School of Nursing. In 1997, she graduated with PhD Nursing from Case Western Reserve University and developed a website called The Comfort Line. According to this theory, every patient has varying range of adaptive responses, which depend on factors such as age, gender, and illness. 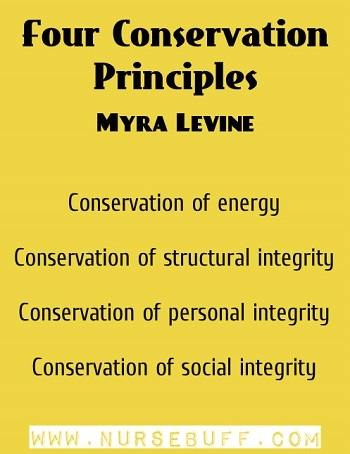 The four principles in Levine’s model of nursing are conservation of energy, structural integrity, personal integrity, and social integrity. The goal is to promote adaptation and maintain wholeness by using the principles of conservation. Born in Chicago in 1920, Myra Estrin Levine earned her diploma in nursing from the Cook County School of Nursing in 1944 and completed her Bachelor of Science in Nursing from the University of Chicago in 1949. She published Introduction to Clinical Nursing in 1969, with additional editions printed in 1973 and 1989. The Change Theory has three major concepts: driving forces, restraining forces, and equilibrium. Driving forces are those that cause change to occur. They facilitate change because they push the patient in a desired direction. Restraining forces, on the other hand, are those forces that counter the driving forces. They hinder change because they push the patient in the opposite direction. Lastly, equilibrium is a situation wherein driving forces equal restraining forces, and no change occurs. 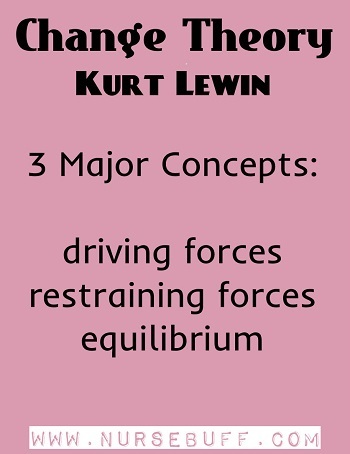 Kurt Lewin was born in 1890 in Germany. When his family moved to Berlin in 1905, he entered the University of Freiburg to study medicine, but opted to study biology instead, which prompted him to transfer to the University of Munich. He spent six months as a visiting professor at Stanford University in 1930. He then worked at Cornell University for the Iowa Child Welfare Research Station at the University of Iowa after his immigration. Following World War II, Lewin was involved in the psychological rehabilitation of former displaced camp occupants at Harvard Medical School with Dr. Jacob Fine. He is now considered the father of social psychology. The Health Promotion Model was designed to be a “complementary counterpart to models of health protection.” It defines health as a positive dynamic state rather than simply the absence of disease. Health promotion is directed at increasing a patient’s level of well-being. 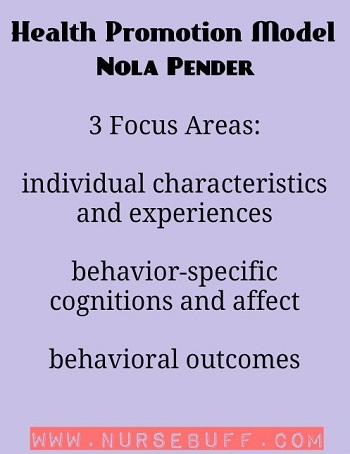 It focuses on three areas: individual characteristics and experiences, behavior-specific cognitions and affect, and behavioral outcomes. 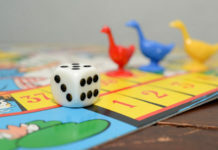 The theory underscores that each person has unique characteristics that may affect their actions. Nola Pender earned her Bachelor and Master’s degrees from Michigan State University in 1964 and 1965, respectively. She earned her PhD from Northwestern University in 1969. She is the co-founder of the Midwest Nursing Research Society, and is currently serving as a trustee. Now a retiree, Pender also spends her time consulting on health promotion research nationally and internationally. This theory includes ten steps used to identify the patient’s problems and eleven skills used in developing a nursing care plan. The problems fall into three categories: physical, sociological, and emotional needs of patients; types of interpersonal relationships between the patient and nurse; and common elements of patient care. 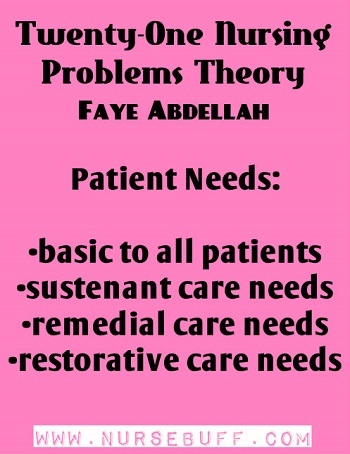 The patient needs are then divided into four categories which include basic to all patients, sustenant care needs, remedial care needs, and restorative care needs. 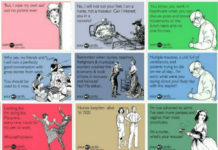 The twenty-one problems can be applied to the nursing process. 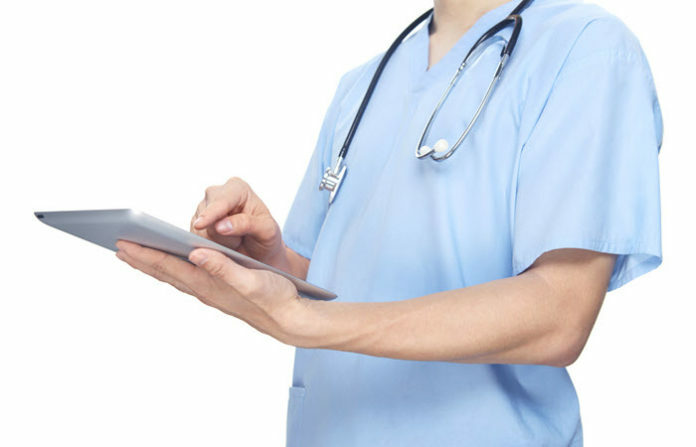 In the assessment phase, the nursing problems provide guidelines for data collection. Faye Glenn Abdellah was the first nurse officer to ever earn the ranking of a two-star rear admiral. She was also the first nurse and woman to serve as a Deputy Surgeon General. Her work helped change the focus of nursing from disease to patient’s needs. For her efforts, Abdellah was inducted into the National Women’s Hall of Fame in 2000. The Need Theory has fourteen components: Breathe normally; eat and drink adequately; eliminate body wastes; move and maintain desirable postures; sleep and rest; select suitable clothes, dress and undress; maintain body temperature within normal range by adjusting clothing and modifying environment; keep the body clean and well-groomed and protect the integument; avoid dangers in the environment and avoid injuring others; communicate with others in expressing emotions, needs, fears, or opinions; worship according to one’s faith; work in such a way that there is a sense of accomplishment; play or participate in various forms of recreation; and learn, discover, or satisfy the curiosity that leads to normal development and health and use the available health facilities. 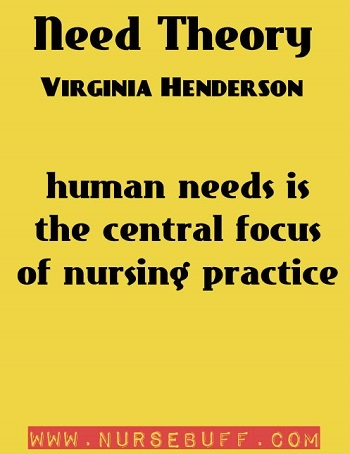 Henderson’s emphasis on the human needs as the central focus of nursing practice has led to the development of the theory regarding the needs of the person and how nursing can assist in meeting those needs. Virginia Henderson, the Nightingale of Modern Nursing, was born in Kansas City, Missouri, in 1897. She earned her diploma in Nursing from the Army School of Nursing at Walter Reed Hospital, Washington, D.C. in 1921. In 1985, she was honored at the Annual Meeting of the Nursing and Allied Health Section of the Medical Library Association. The Goal Attainment Theory describes a dynamic, interpersonal relationship in which a patient grows and develops to attain certain goals in life. 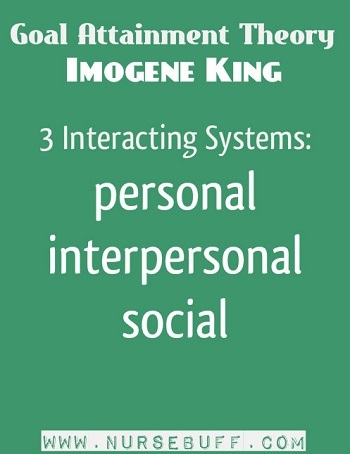 The model has three interacting systems: personal, interpersonal, and social. Each of these systems has its own set of concepts. According to King, a human being is a social being who is rational and sentient. He or she is able to perceive, think, feel, choose, set goals, select means to achieve goals, and make decisions. He or she has three fundamental needs: the need for health information when it is needed and can be used; the need for care that seeks to prevent illness; and the need for care when he or she is unable to help him or herself. Born in West Point, Iowa, in 1923, Imogene King earned her nursing diploma from St. John’s Hospital School of Nursing in St. Louis, Missouri, in 1945. In 1948, she earned her Bachelor of Science in Nursing from St. Louis University and then completed her Master’s of Science in Nursing in 1957. In 1961, she earned her doctoral degree from Teachers College, Columbia University. 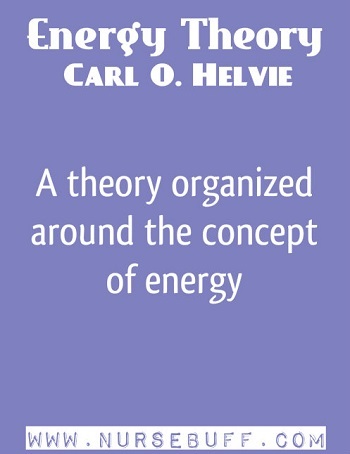 The Helvie Energy Theory revolves around the concept of energy. The individual can be viewed as an energy field affecting and being affected by all other energy fields in the physical, biological, chemical and psychosocial environments as well as community subsystems through exchanges. These exchanges of energy and individual success or failure in adaptation determine actual or potential placement on an energy continuum, and the need for assistance from the health practitioner. This theory is applied in practice through a process of assessing, planning, intervening, and evaluating. Carl Helvie is a registered nurse who earned his masters in public health nursing focusing on wellness from the University of California. He then earned his second masters degree in public health and wellness from the John Hopkins University, and his post doctoral study in the Divinity school at Duke University. In 1999, he was awarded the Distinguished Career in Public Health Award by the American Public Health Association. For 60 years, he became a nurse practitioner, educator, author, and researcher. He helped thousands of patients improve their health and taught around 4,000 graduate and undergraduate nursing students. In 2002, he taught at the University of Applied Sciences in Frankfurt, Germany and served as a nursing consultant to Russia. In this model, nursing is defined as the practice of identifying a patient’s need through observation of presenting behaviors and symptoms, exploration of the meaning of those symptoms with the patient, identification of the cause of discomfort and the patient’s ability to resolve it. The goal of nursing consists primarily of identifying a patient’s need for help. 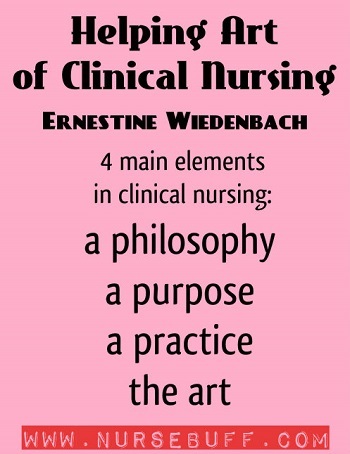 The theory identifies four main elements in clinical nursing: a philosophy, a purpose, a practice, and the art. It explains that knowledge encompasses all that has been perceived and grasped by the human mind. According to the theory, a nurse uses two types of judgment in dealing with patients: clinical and sound. Clinical judgment represents the nurse’s ability to make sound decisions. Sound judgment, on the other hand, is the result of disciplined functioning of mind and emotions, and improves with expanded knowledge and increased clarity of professional purpose. Born in Hamburg, Germany, in 1900, Ernestine Wiedenbach earned her Bachelor of Arts from Wellesley College in 1922, and her Registered Nurse’s license from the John Hopkins School of Nursing in 1925. She then earned her Masters of Arts from Teachers College, Columbia University in 1934. In 1946, Wiedenbach earned a certificate in nurse-midwifery from the Maternity Center Association School for Nurse-Midwives in New York, and taught there until 1951. The following year, she joined the faculty of Yale University as an instructor in maternity nursing. She became an assistant professor of obstetric nursing in 1954. The Helping and Human Relationships Theory concludes that our task in life is to improve the quantity and quality of our human experience as well as others’. When we use our helping skills effectively, we can be healthy and can help each other in actualizing our human potential. 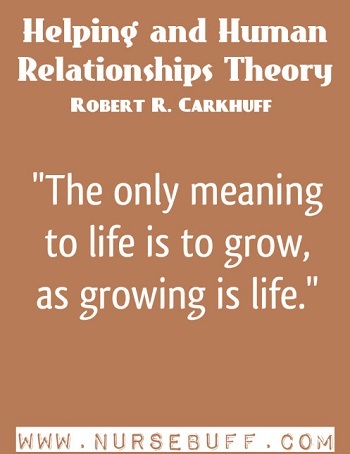 The only meaning to life is to grow, as growing is life. Robert Carkhuff, Ph.D., is a social scientist who developed “The Science of Human Generativity”. He is known as the ‘Father of the Science of Human Relating’. His early works like ‘Helping and Human Relations’ and ‘The Development of Human Resources’ are still considered classics. Carkhuff has been recognized as one of the “most-cited” social scientists in the 20th century. He is already among the most prolific scientists of the 21st century with more than 15 major works. Nancy Roper started her nursing career in Wetheral near Carlisle as a student. In 1943, when Roper became a state registered nurse, several of the nurse teaching staff had been called up as members of the Territorial Army. She gained a London University sister tutor’s diploma in 1950. She achieved MPhil degree at Edinburgh University in 1970, and then worked as the first nursing research officer for the Scottish Home and Health Department. Winifred Logan earned her M.A. in Nursing from Columbia University in 1966. In the 1960’s to 1970’s, she was appointed as Nurse Education Officer at the Scottish Office. Later, she was able to establish nursing services in Abu Dhabi. Allison Tierney was one of the very first nurses to earn a PhD in the United Kingdom. She was promoted as a personal chair in nursing research after ten years of working as the Director of Nursing Research at the University of Edinburgh. Later, she joined Roper and Logan as they began to develop, refine, and publish the Activities of Living Model. 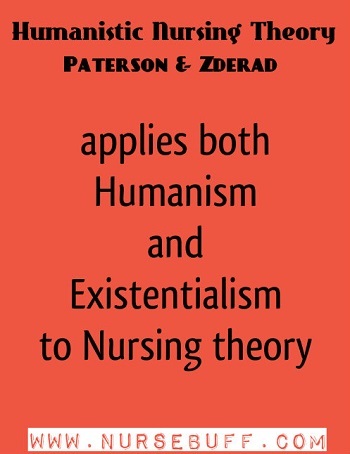 The Humanistic Nursing Theory applies both humanism and existentialism to nursing theory. Humanism tries to take a broader perspective of the individual’s potential and attempts to understand each individual from the context of their own personal experiences. Existentialism, on the other hand, is the belief that thinking begins with the human — the feeling, acting, and living individual. It emphasizes person’s free choice, self-determination and self-responsibility. As soon as a patient and a nurse come together, nursing dialogue begins. The nurse presents herself as a helper who is ready to assist and care for the patient. She is open to understanding the patient’s feelings with the intention of improving it. Dr. Josephine Paterson is originally from the east coast while Dr. Loretta Zderad is from the mid-west. They both were graduates of diploma schools and subsequently earned their bachelor’s degree in Nursing Education. Dr. Paterson did her graduate work at Johns Hopkins and Dr. Zderad did hers at Catholic University. In the mid-fifties, they were both employed at The Catholic University and worked together to create a new program that would encompass the community health and psychiatric components of the graduate program. Josephine Paterson and Loretta Zderad retired in 1985 and moved South where they are currently enjoying life. Although they are no longer active, they are pleased at the on going interest in their theory. 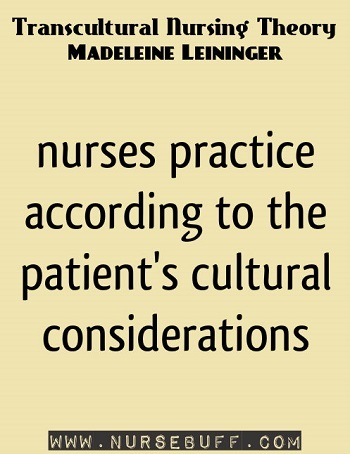 In Transcultural Nursing, nurses practice according to the patient’s cultural considerations. It starts with a culturalogical assessment wherein the nurse considers the patient’s cultural background in assessing the health of the latter. The nurse then make a nursing care plan based on the culturalogical assessment. In this theory, nurses have a responsibility to understand the role of culture in a patient’s health. Leininger identified three nursing actions that achieve culturally friendly care for the patient: cultural preservation or maintenance, cultural care accommodation or negotiation, and cultural care repatterning or restructuring. Born in Sutton, Nebraska, in 1925, Madeleine Leininger is a registered nurse, and earned several degrees, including a Doctor of Philosophy, a Doctor of Human Sciences, and a Doctor of Science. She is also a Certified Transcultural Nurse, a Fellow of the Royal College of Nursing in Australia, and a Fellow of the American Academy of Nursing. The Moral Development Theory consists of 6 stages of moral development which are divided into 3 levels. Created by Lawrence Kohlberg, it was inspired by Jean Piaget, a psychologist, and John Dewey, a philosopher. The theory focuses on morality which is the system a person uses to determine what’s right and wrong. The answer to that is what forces a person to take action. Postconventional which uses the principle behind those social norms which direct behaviors. The theory is a great help in understanding patients and the way they react to things and events. It can also enlighten nurses as to why patients behave the way they do. Lawrence Kohlberg was born on October 25, 1927. He was an American educator and psychologist who became highly influential in education and psychology because of how his theory was able to explain in detail a child’s moral development. Alfred Adler believed that the development of traits and behaviors are affected by developmental issues. This included birth order. In the theory, first-born children often need affirmation and are prone to becoming perfectionists. They are dominant and intellectual which can be attributed to the children’s effort to get back their parents’ undivided attention. Second and middle children, on the other hand, tend to be more rebellious and competitive since there’s always a sibling who was there first. They are eager to be praised which is why they work hard to develop their gifts. They tend to be more diplomatic and flexible than the rest of the family. Youngest and only children tend to be selfish since they are always being cared for by family members. They may have a hard time when people around them say no to their requests. Born on February 7, 1870, Alfred Adler was a therapist and doctor who formed individual psychology or Adlerian psychology. He was one of the first people who worked hard to introduce mental health into education.